Even though we have said hello to Spring here in So Cal, I could not let the warm weather completely takeover before I share this fabulous winter make. The Jasper Sweatshirt, stylish, fashion forward and modern, looks like it could be a part of an upscale athletic RTW collection. 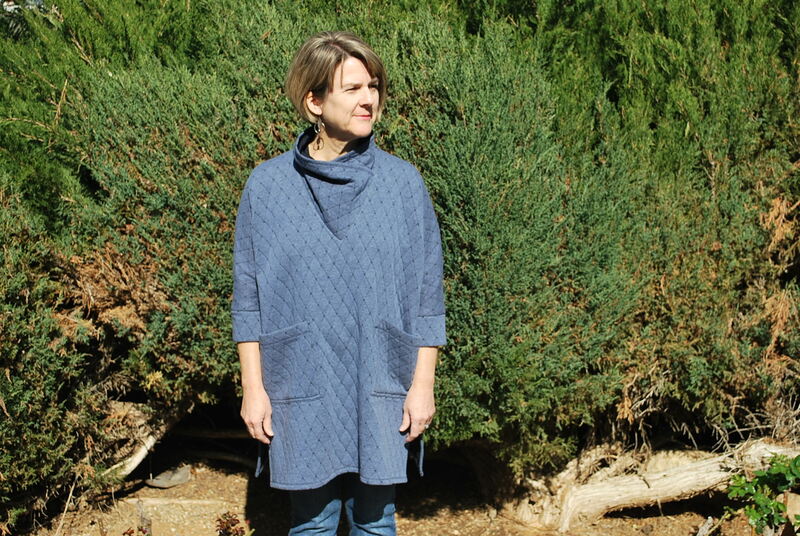 The PDF pattern by Paprika Patterns is actually titled “Jasper Sweater & Dress.” I first discovered this pattern while reading a post from Mahlica Designs blog well over a year ago. I purchased it soon after, but it sat in my pile for quite some time. There is a Sweater and Dress view, and a collar or hood option. 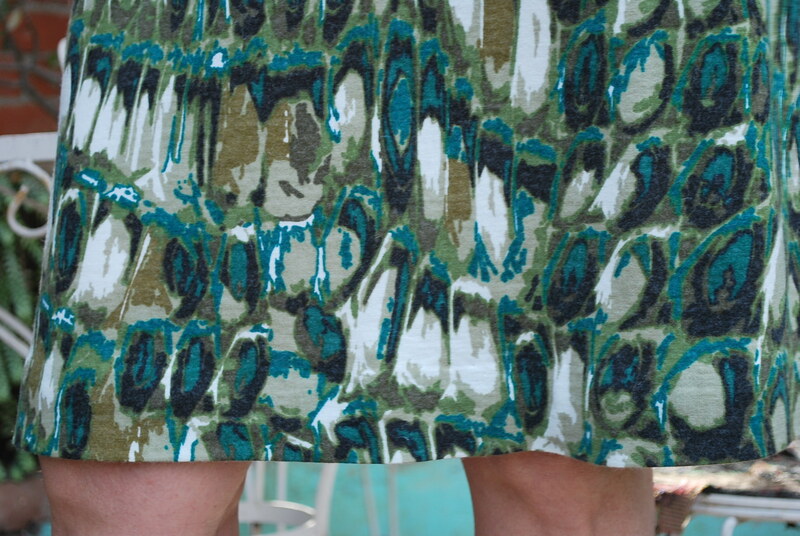 My catalyst to finally make the Jasper was this amazing fabric I found at Mood on La Brea Avenue in Los Angeles. The front side has a smooth texture with snazzy, verigated lines of blue, green and grey. 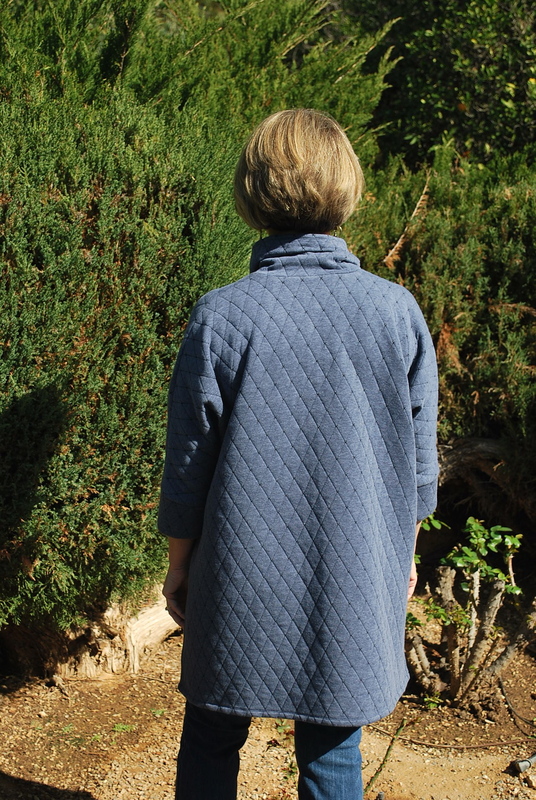 The back side is a cuddly, soft, ribbed, grey fleece. I was obsessed with this fabric when I discovered it stuffed amongst all the sweater knits at Mood. It was $25 per yard, and I didn’t care. I loved it’s unique two sided-ness, and it’s promise of comfy warmth on a winter walk in So Cal. I top-stitched most of the seams with a stretch double needle. 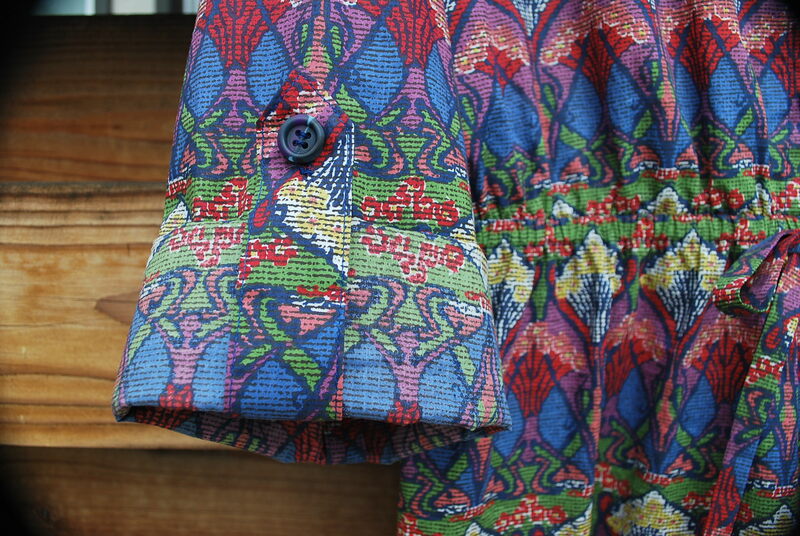 The welt pockets are probably the most intimidating feature of this well drafted stylish, sporty pattern. Once wearing the garment, you realize how well worth the effort they are. Who doesn’t love resting their hands in a comfy pouch across their belly? 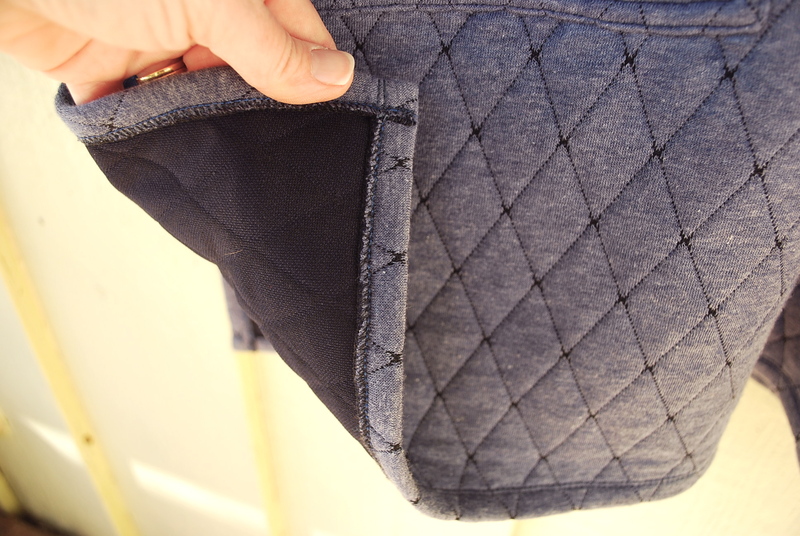 The bottom of the pouch pocket is not sewn into the bottom band. I was afraid it would sag or create bulk on the front side when wearing, but it doesn’t! 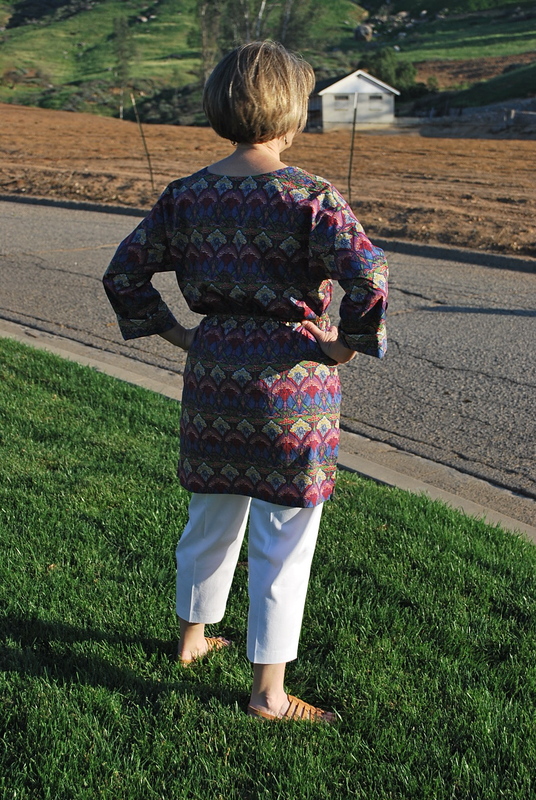 The pattern features princesses seams on front and back which makes for a nice modern fit. The hood has a unique design. I like how it creates a wide opening at the neck and around the face. 1. I cut a size straight size 4 and I’m very pleased with the fit. 3. I was confused as to why the pouch pocket was longer than the main front piece, also, as to whether the bottom of the pocket got sewn into the bottom band. The instructions were not clear to me. I emailed Lisa at Paprika Patterns with my questions. I was very pleased that I heard back from her within a few hours. Those of you that follow her on social media, know she lives somewhere in France in a yurt. Thanks for taking the time to read my post. I always welcome your comments. Have you been wanting to make a Jasper? This is my son named Jasper! That’s really why I bought the pattern! I’m a fan of the TV show “What Not To Wear.” I truly have internalized some of Stacy and Clinton’s bits of advice in my quest to put together my daily outfits. One of their favorite pieces of advice is to pull stuff of the rack that you wouldn’t normally grab, and just try it on. You might be surprised. This is how I have approached my pattern selection while sewing myself stylish. Sometimes I choose styles that I like, but think that they might not be “right” for me. Fresh Make #25 is one of those patterns. I tried it, and I like it! 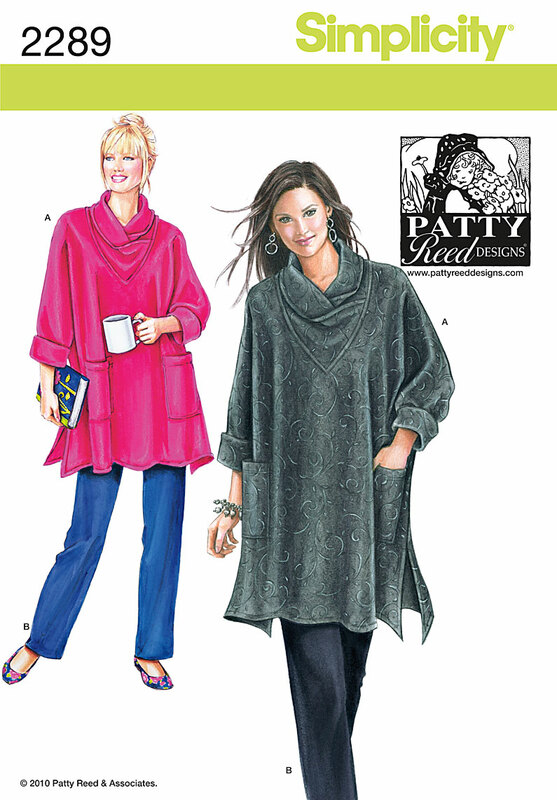 The pattern I used is Vogue 8985. I purchased it the only way I buy Vogue patterns – on sale at JoAnn’s for $4.99. 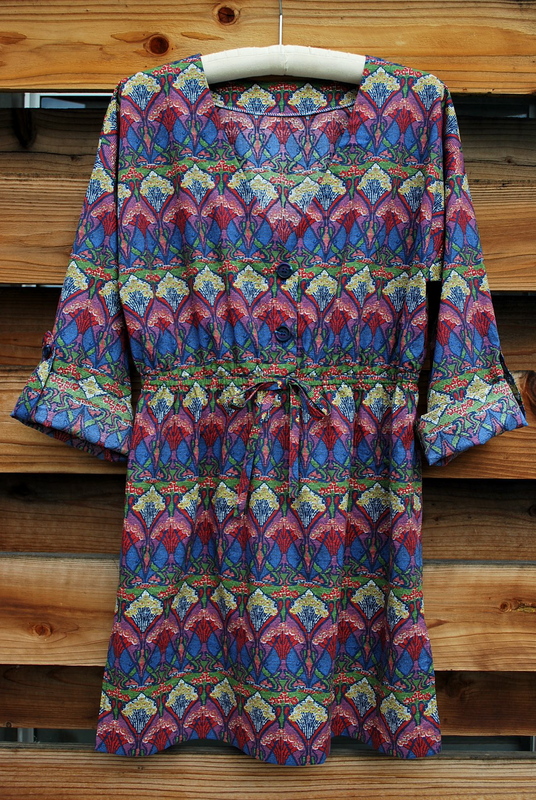 I named it The Good Life Shirt because it seems like the type of clothing you would wear while indulging in the leisure arts as such picnicking, wine tasting, strolling through beautiful gardens, dining al fresco at the beach, etc… If you have a reason to wear this tunic, your life is good. 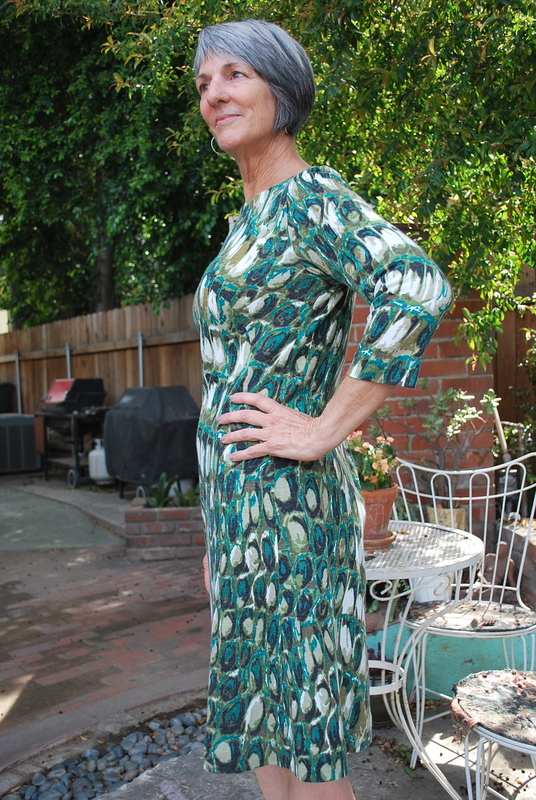 The fabric is once again from one of my favorite stores, Mood Fabrics on Brea Avenue in Los Angeles. It is smooth, finely woven lawn cotton. I purchased 3 yards at $14.00 per yard. I also made the pants that were included in the pattern. May I add that this is my first pair of white pants EVER. I have always felt that white would not look good on my bottom half. But I since the tunic is LONG, I went for it. I actually like my first pair of white pants. The top and the bottom are separate pieces, and the elastic casing is formed with their seam. The bow is decorative. It does not go through the casing. The sleeves are long. They are rolled up so the wrong side of the fabric shows and are held up with a button tab. I machine finished both the side slits and the hem. Inside peek. I serged all my seams and the facing edges. 1. I do not know how Vogue comes up with their ratings. I think they are rated relative to the other patterns in the book. In terms of the seamstress, I think there is an assumed level of competency. This pattern is labeled “very easy,” but by no means is beginner project in the broader world of sewing projects. 2. I cut a size Small (8-10). My bust definitely is larger than 31 1/2 – 32 1/2, but most of us know that when a big four pattern is “loose-fitting” we know that really means LOOOOSE fitting. And it fit perfectly. I did do one slight adjustment. I added 1/4″ to the side seams because I wanted to have enough ease through my hips and thighs. 3. 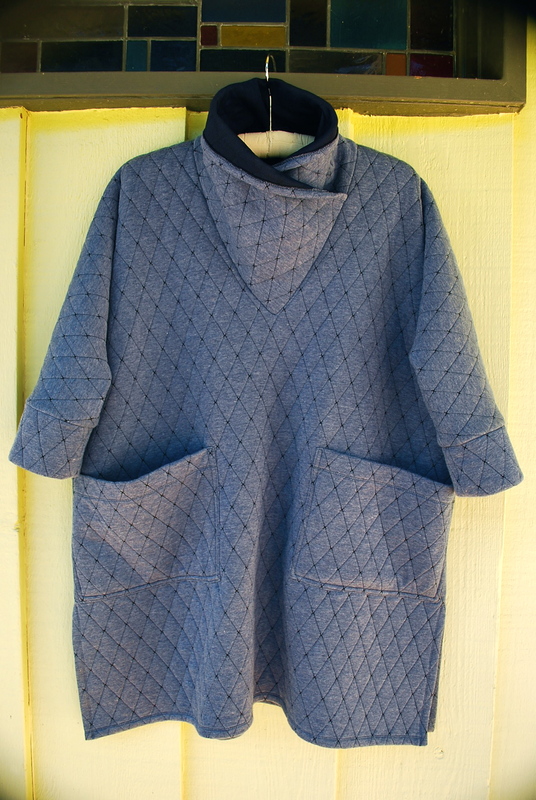 The pattern had seam pockets. I did not include these as I did not want any bulk added in my hip/thigh region. 4. I am not blogging about the pants. 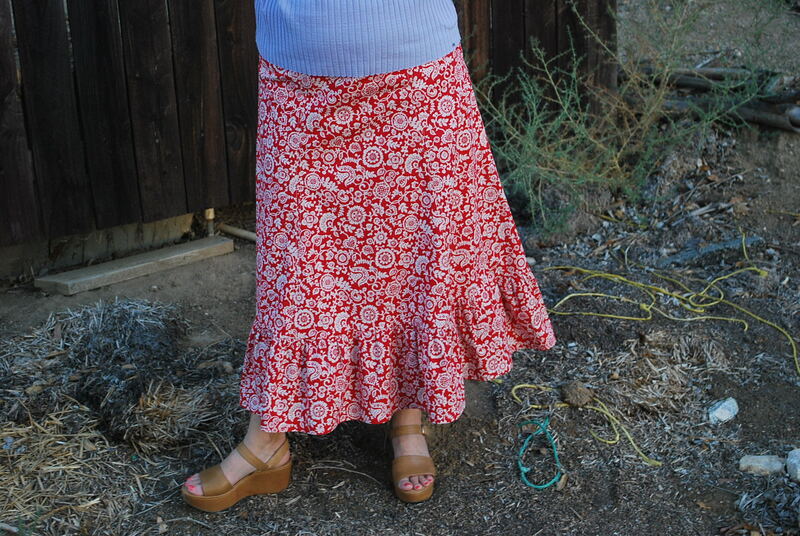 But just an FYI if you want to make them, I narrowed them a couple of inches – tapering from the hips to the ankles. They are just simple elastic waist pants, and I also took out width at the top because I didn’t want more fabric than necessary bunching under the tunic. The fabric is a lycra, cotton twill, so they can stretch over the hips when I pull them on. I have no desire to do sewing “tutorials” on my blog. I do not want to stop and stage photos of my WIP, and then compose instructional text to go along with it. (I actually don’t enjoy writing.) I know all the popular sewing blogs out there include tutorials. So I guess I’ll never be a blogging superstar. But in my my defense, I do include a lot close-up, detail photos of my makes, so it’s not just all “show and tell.” And those photos do get “clicked” on frequently, so perhaps I am helping some sewist in some small way. Don’t get my wrong, I LOVE to teach people sew. I would just rather do it in person. Additionally, if a reader asked me a question about something I’ve posted, I would be thrilled to help them. You can wear the collar turned down if you prefer. The fabric is actually not sweatshirt fleece. 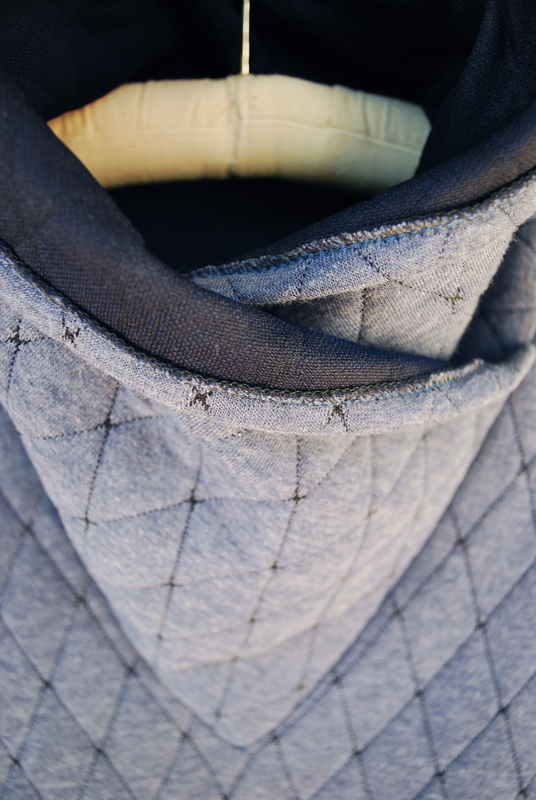 It is a quilted knit with a polyester backing; it might even be moisture wicking or some such thing. There a thin, middle layer of a soft, synthetic batting that sheds all over the place on the raw edges. For those of you that might not know, Mood Fabrics sells leftover rolls of fabric from RTW clothing lines, so it’s not possible to get detailed information like exact fiber content on the fabric. 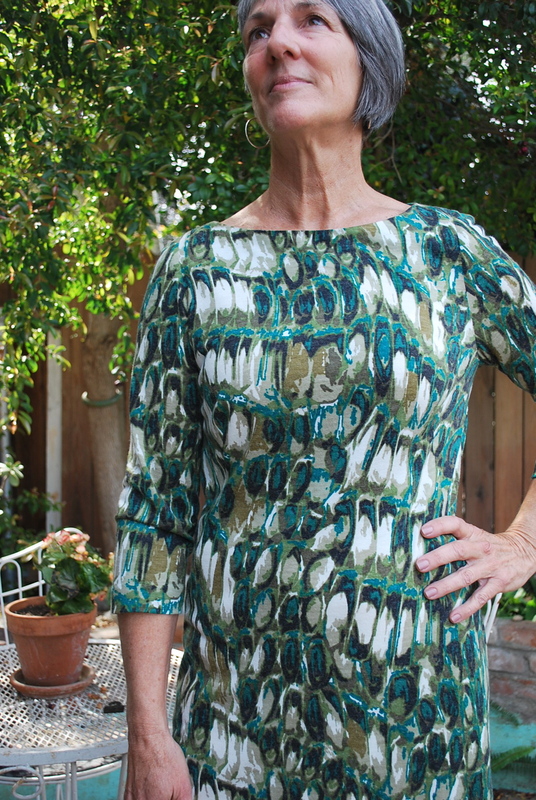 I hemmed the neckline and bottom with a double needle, and finished my seams with a serger after sewing them with a regular stitch on a regular machine. There is not enough stretch in this fabric to warrant any special knit stitches. 1. The pattern comes in size XS – XXL. I cut a size Small (10-12). As you can plainly see, this is BIG tunic and I’m definitely glad I made a Small. 2. Being so loose fitting, there was no need for any adjustments. 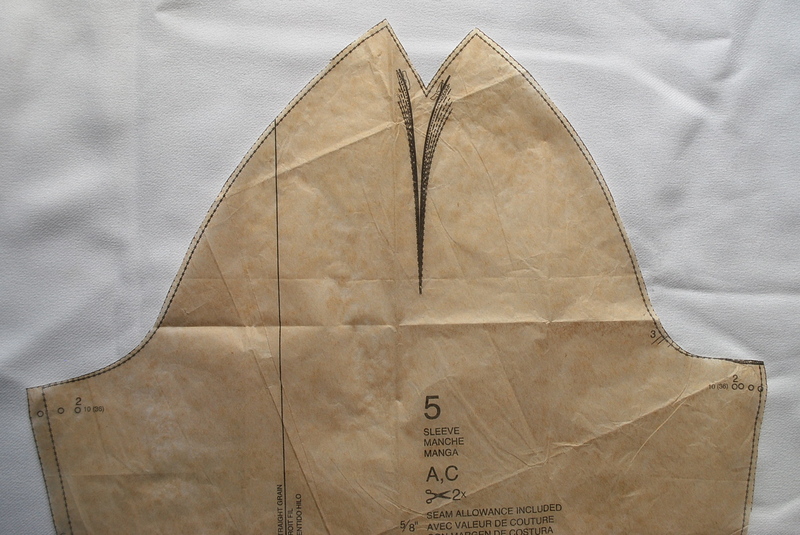 However, as I often routinely do, I took off an inch off both the sleeve and body length before cutting. 3. I am small busted, and I like the way this garment hangs on me. 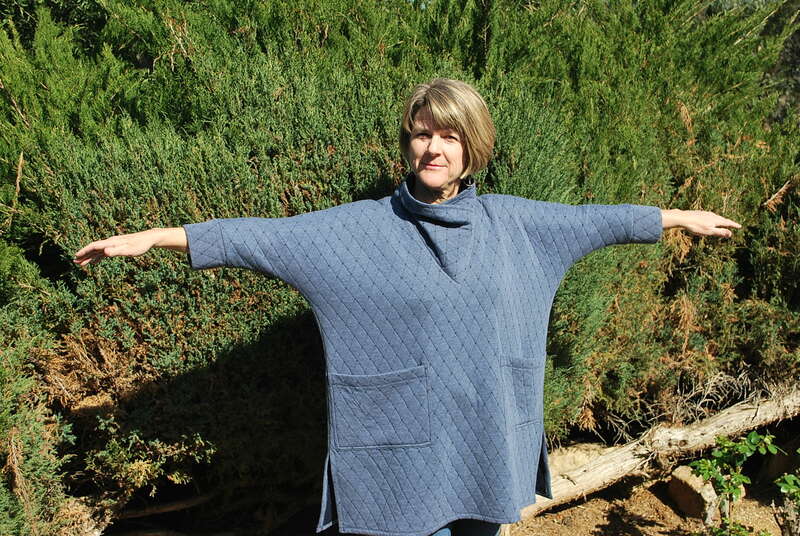 I did google some other reviews on this pattern and there were some negative comments from larger busted woman about how it made them feel even larger, like a linebacker. 4. 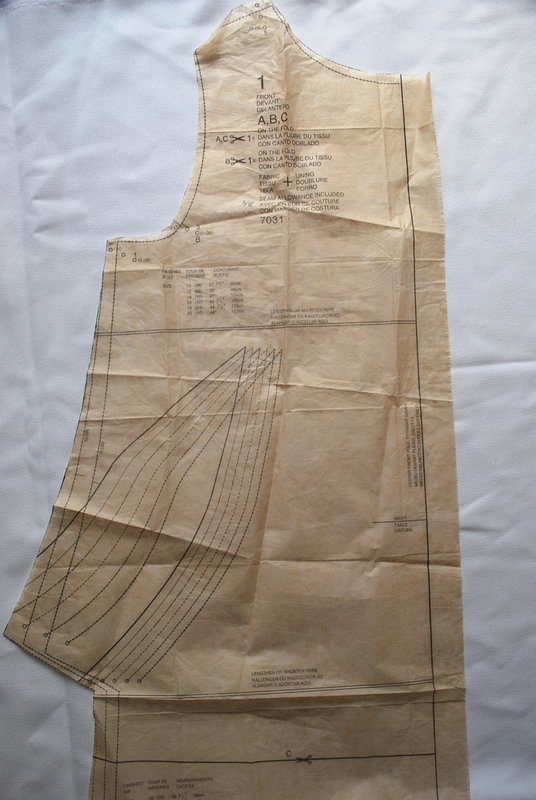 Overall this is an easy pattern to sew up provided you are comfortable sewing with knits. I had to do my most “careful” sewing when I was making the patch pockets. I hand basted them in place first before machine stitching them to the body because I thought the knit fabric might pucker and stretch if I just secured the pockets with pins. This blog has forced me to look at myself in a lot of photos and I rarely like what I see. I alway tell my photographer to take lots and lots of pictures so I will find at least three good ones. Even though I am very conscientious about dressing to flatter my body, I always look fatter than I envision myself as being. But, oh well, I’m sort of getting used to that. What I hate even more is seeing the winkles on my face! My 78 year old mother has less wrinkles than I do. Every time I look at my face in a photo, I get why so many women have “work” done. I’ve only made two skirts since starting this blog, and my go-to Jean Skirt now has a rip in it from being caught on a metal edge and is out of commission. 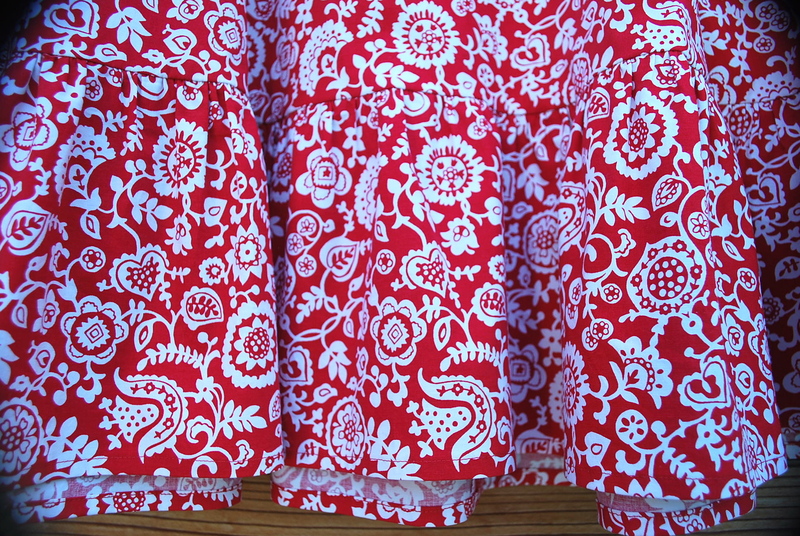 I thought it was time to sift through my ever growing pattern stash and find a fun skirt to make for Fresh Make #17. 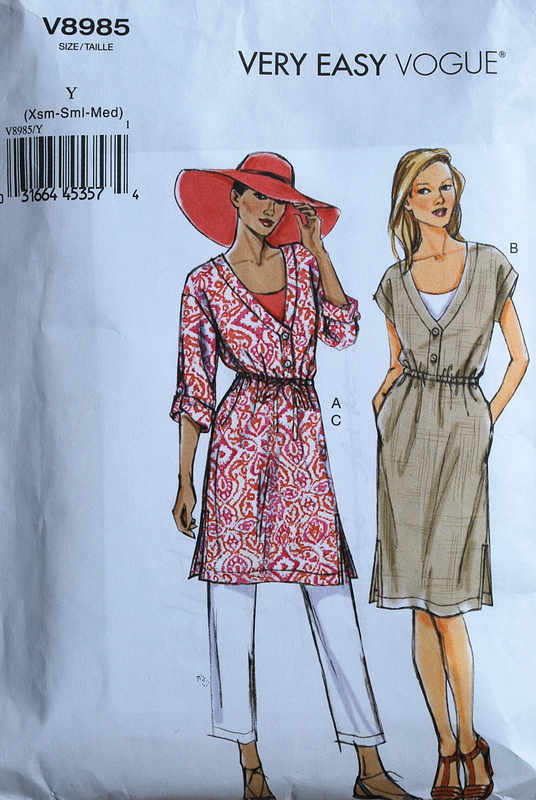 The pattern I chose is Simplicity 1888. I bought it several months ago during a pattern sale at JoAnn’s, most likely for $1.00 but possibly $1.40. (JoAnn’s 5 for $5.00 recently have become 5 for $7.00. Hey, you can still count me in!) I was drawn to this pattern because it looked like a good balance between fitted and flared, and the gathers were where I like them – at the bottom, not the waist! 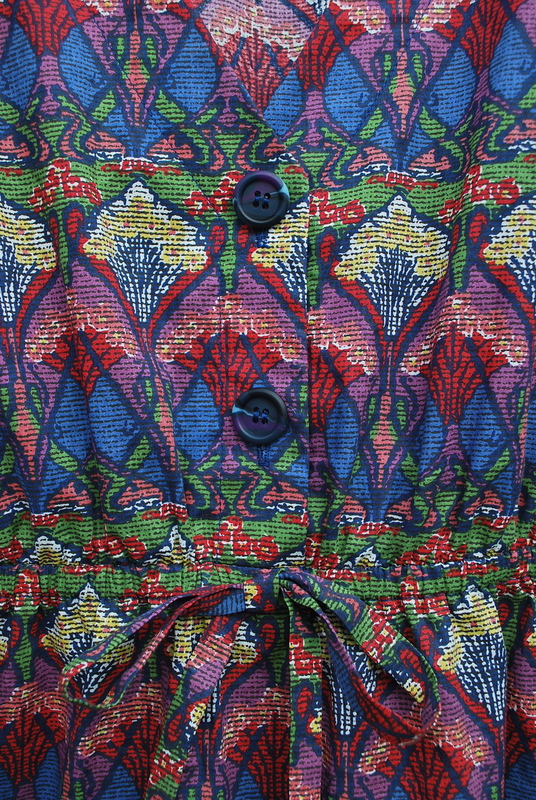 I named it the Happy Folk Skirt because, depending on the fabric, this skirt can either have a hippy folk feeling or ethnic folk feeling. I purchased the fabric at Mood on La Brea in Los Angeles. I was excited to stop by there on my way home from seeing my sometimes model and always daughter off at LAX for her second year of college. I hadn’t been to Mood in six months, and as it usual it was overwhelming. I forced myself to focus in the task at hand. 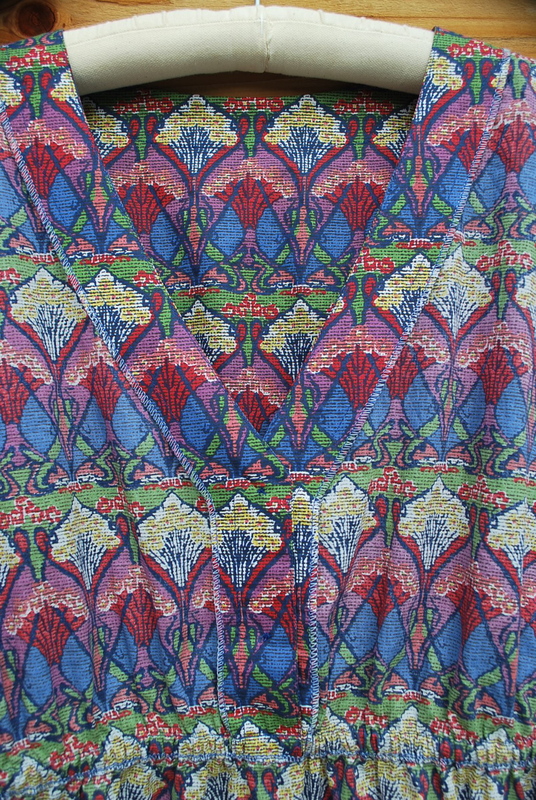 This is a cotton woven fabric with lycra. It’s actually stretchy! I bought the indicated amount of 3 1/4 yards at $12.00. I managed, however, to have quite a bit leftover and probably could have gotten away with 2 3/4 yards. 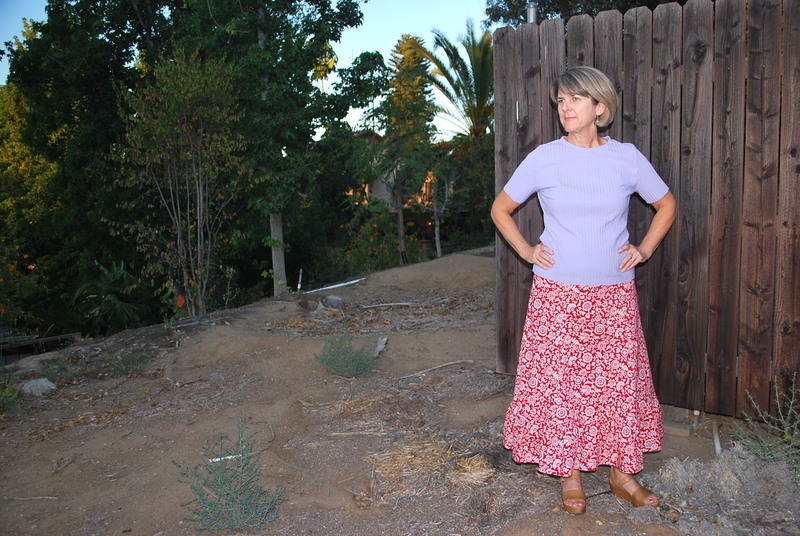 The skirt has a wide, curved waistband that sits best a few inches below the natural waistline. I top-stitched the seams and waistband with quilting weight thread. There is a 7″ ruffle at the bottom. Inside peek. I serged all the seam edges and the waistband edge. 2. I love the styling on this pattern. The panels create the perfect amount of flair for a flattering fit and the ruffle is a fun touch. I love the fabric, too. I do feel however, that the fabric is not optimal for this pattern. 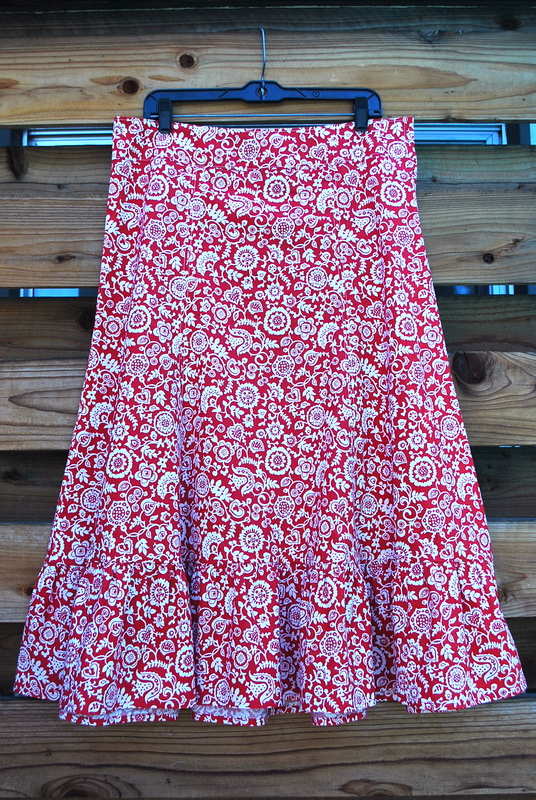 This fabric had the folksy feel I wanted for this pattern so I ended up overlooking the fact that it was a bit heavy and stiff for this skirt. I think it would be perfect for a pair of shorts or capris. 3. I should have cut 2″ off the bottom before attaching the ruffle. 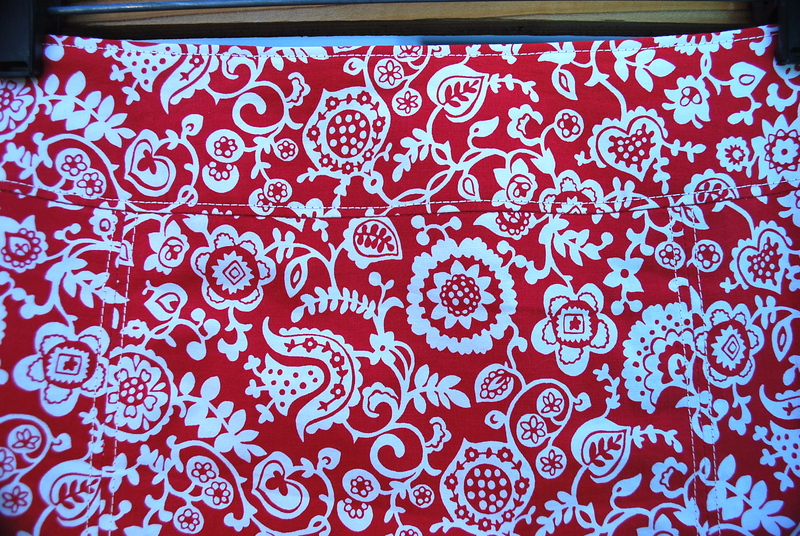 I already shorten the skirt panel pattern pieces 2″ before cutting the fabric, but it still turned out a bit long. I think am getting lazy or impatient, because I tried it on several times before adding the ruffle but just didn’t carefully evaluate how much length a 7″ ruffle would add. Oh well. It looks fine with my 3″+ platform sandals that I love. 4. I made the t-shirt that I’m wearing also. 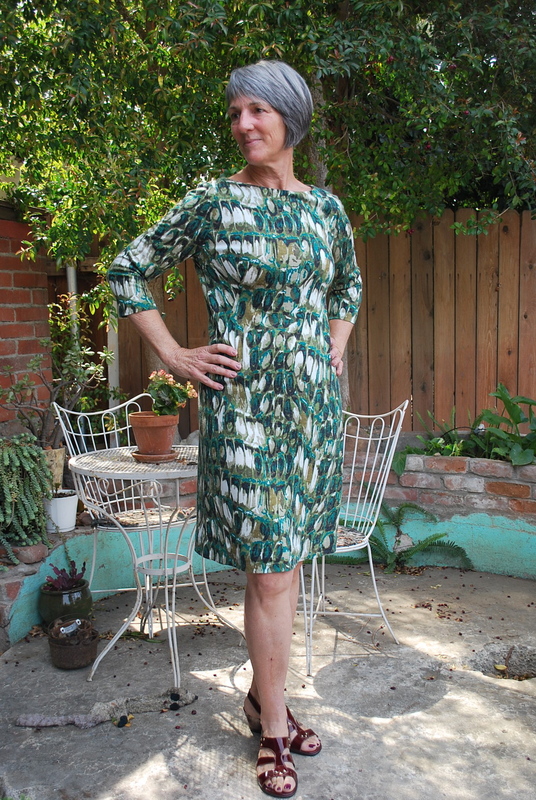 It is Butterick 5215. More on this pattern another day. This wide ribbed knit fabric is also from Mood. 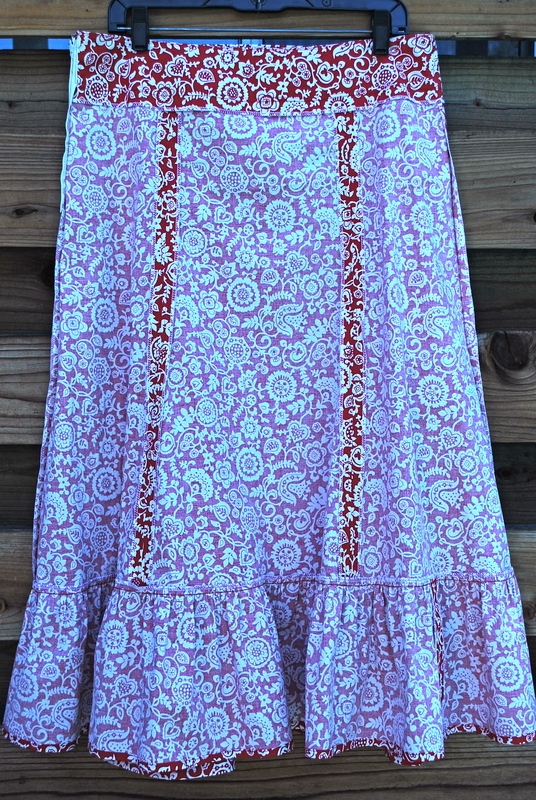 I love the lilac color with the red and white print. I think it actually acts as a neutral against the bold red. Sewing others stylish is just as much fun as sewing myself stylish! 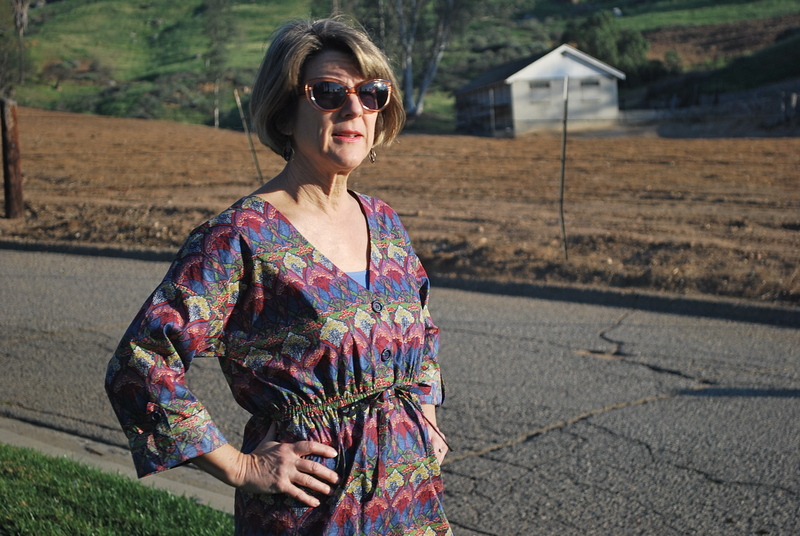 That’s why I’m so excited to feature my beautiful friend, Sandra, as a guest model in this post. 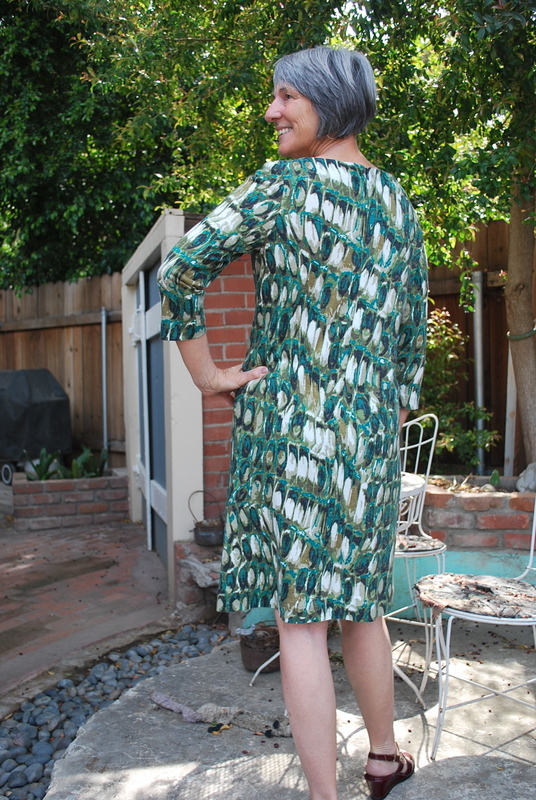 For Fresh Make #7, I have made a versatile shift dress. 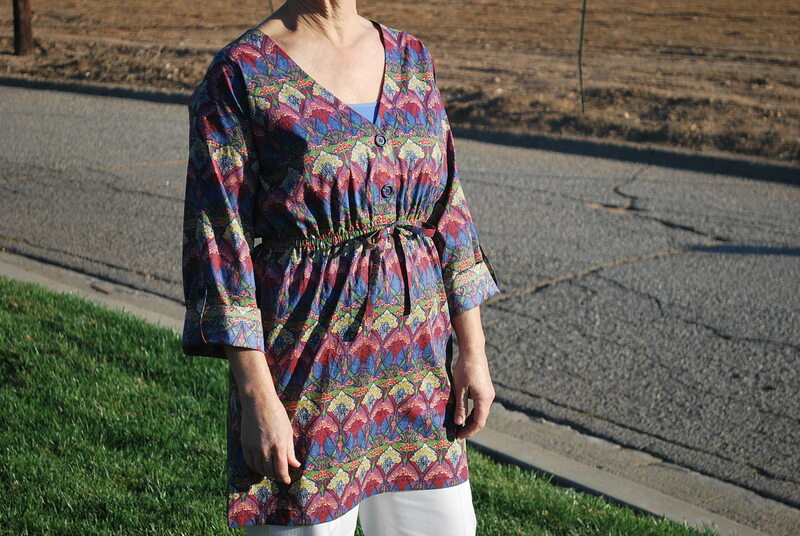 The pattern I used is Burda 7031. I purchased on sale at JoAnn’s for $2.49. A few months ago, I posted it to my Facebook page as a pattern that I thought would be flattering on all figure types. “Who would like to make it?”, I posed. And Sandra said, “I would!” Sandra’s machine and sewing skills were a bit rusty, so I offered to make the dress for her and feature it in my blog. 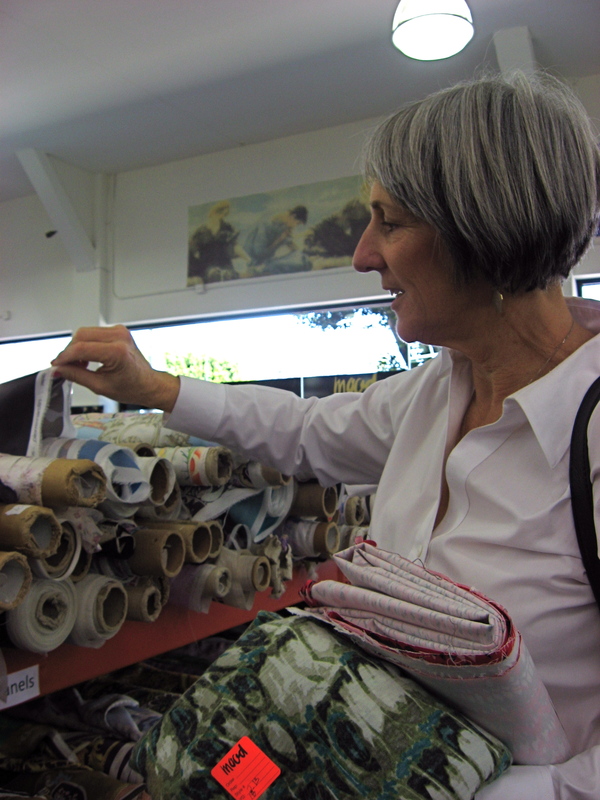 Now here’s the super fun part about sewing for friends – the shopping trip to buy the fabric! We went to Mood on La Brea Avenue in Los Angeles and had a blast imagining ourselves as designers on Project Runway. Sandra is captivated by all the luscious fabrics. We spent at least 90 minutes wondering up and down the aisles, drooling and touching fabrics. 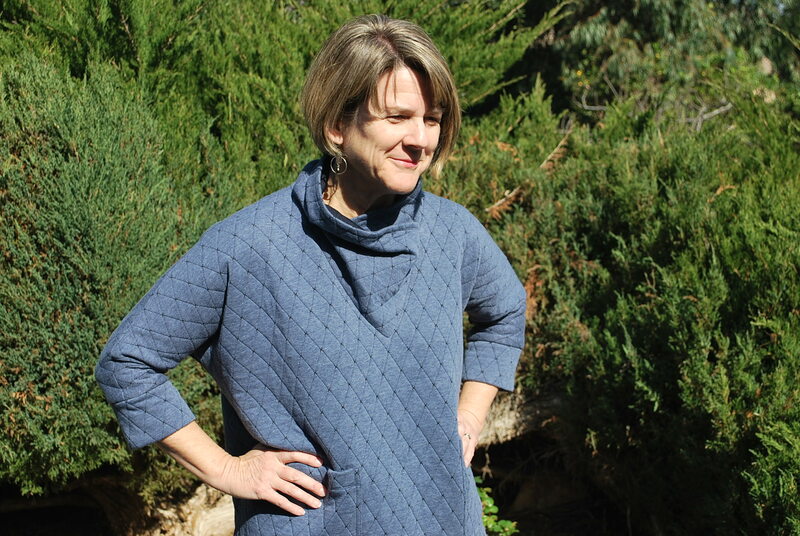 Sandra finally choose this luxurious knit wool jersey. The pattern requires 2 5/8 yards. I think the fabric was $18 per yard. And did Sandra care? No, it was gorgeous! Fabric bought, time for lunch! We walked up four blocks on La Brea to Sycamore Kitchen and both had salads were to die for. The Sycamore Kitchen is also directly across the street from recent Austrialian transplant, The Fabric Store. What a great day! 1. I when sew for others, the size I make is confidential, even to my client! I want having a garment custom made to be a wonderful, feel-good experience. 2. 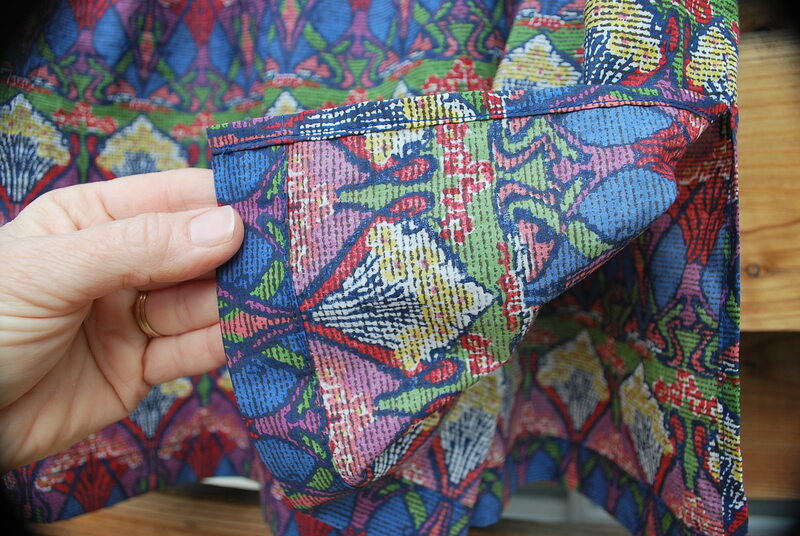 Sandra wanted the sleeve to become narrower towards the hem instead of the slight bell shaped of the pattern. I took about 4″ total off the bottom of the sleeve width. 3. I thought an interesting element to this otherwise very basic pattern was the bust dart. Sandra loved the shape that it created, too. This dart may look unusual, but it creates a great shape. 4. I found a big surprise as I began cutting and sorting through the pattern pieces. There was a dart at the top of the sleeve. I don’t think I’ve ever encountered a sleeve with a dart at the top before. I considered manipulating the pattern to remove the dart because I was concerned that the sleeve might be a bit pointy where the dart ended. But then I decided I would go with it. It was part of the design vision for this pattern. To my delight, the sleeve actually turned out beautiful. 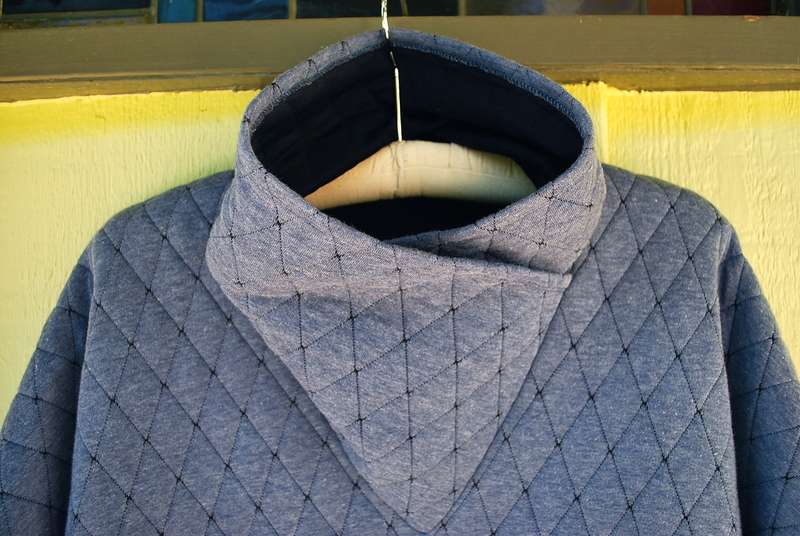 This amazing wool jersey fabric molds itself like cake fondant when a steam iron is gently used on it. The dart is not even noticable. 5. I added 2″ to the hem when cutting the fabric to be sure I had enough length to create a hem that hit slightly past the midpoint of the knee. This is a flattering spot for a hem as it accentuates the narrower part of your upper calf without showing your whole knee. Sandra and I were giddy with excitement when I brought her the finished dress. We were thrilled with the perfect, flattering fit. 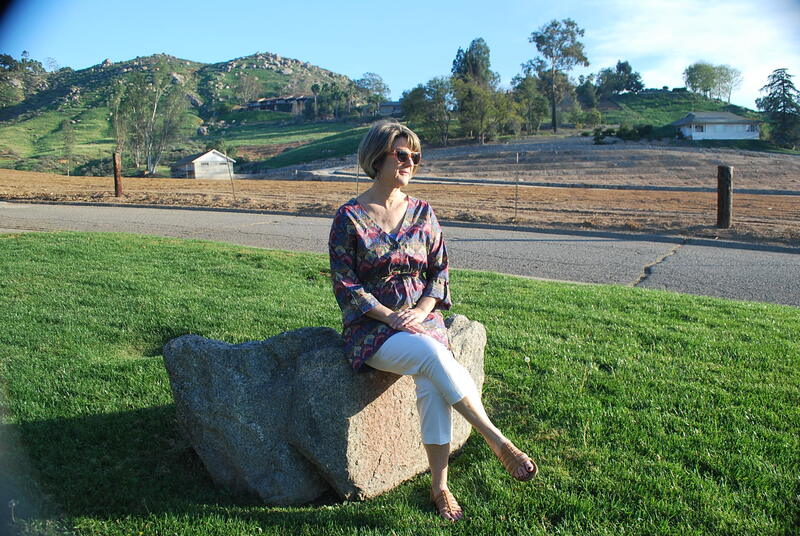 For Sandra, wearing it is as comfortable as a nightgown, and no shape wear required! 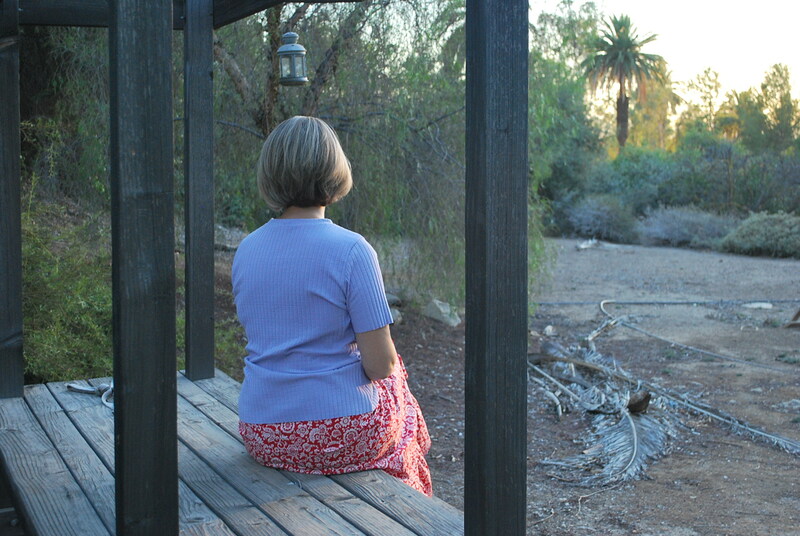 Thank you for taking the time to read this post. As always, I welcome your comments.